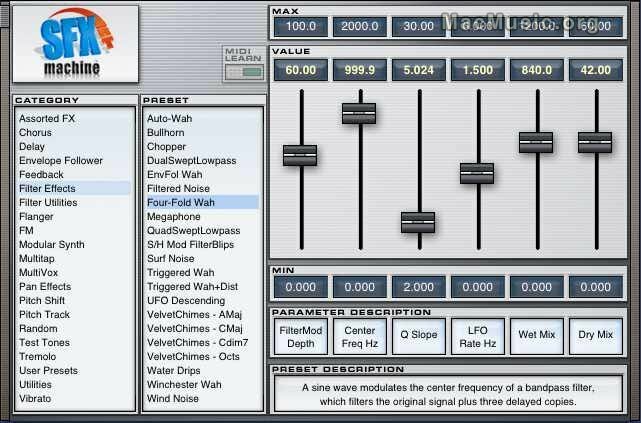 The Sound Guy announced the release of SFX Machine RT 1.02 for Macintosh, a real-time version of the award-winning SFX Machine audio effects plug-in. SFX Machine RT is available in Audio Unit format for Mac OS X, as well as VST format for Mac OS 8/9/X. The 1.02 update adds a Randomize button, optimized audio processing and other enhancements... SFX Machine RT comes with hundreds of presets, including conventional effects like choruses and flangers as well as a wide variety of unique effects. Many of the presets include a pitch tracker or envelope follower, allowing the effect to respond intelligently to the input signal. The plug-in also allows automated parameter control via a simple "MIDI Learn" interface.